This is a luscious, creamy, indulgent texture sort of ricotta recipe. I am OBSESSED with it, no joke. I could not get over how creamy, fluffy, and perfect it came out. I have made several ricotta recipes over the years, but nothing that made me write about it, till now. I have played with different mixtures of milk and creams, but this is it. A perfect paring of the milk, and cream that I let sit out for way longer than any recipe recommends. It is worth the wait. I got it super creamy. I took a picture on Instagram, ate a piece of flatbread I made that day for the Sabra hummus post, a warm kale salad, and this ricotta slathered on the flatbread. It was pure heaven. It didn’t even need the drizzle of olive oil I put on it, It just needed itself in all it’s glory. Heaven. You will need a large candy thermometer for this recipe. I adapted this from Deb at Smitten Kitchen. 1. 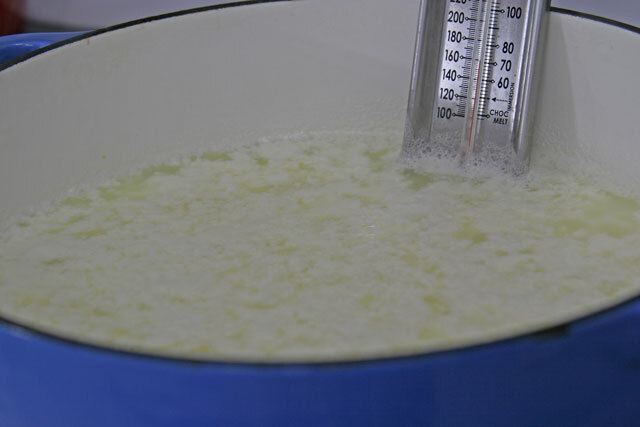 In a large pot or dutch oven fitted with a candy thermometer, add the milk and cream over medium low heat. Bring to 190 degrees, stirring frequently so you don’t burn the bottom. This takes about 10 minutes. Remove pot from heat, stir in the lemon juice gently. You will immediately see the curds forming. Let stand for a few minutes. 2. 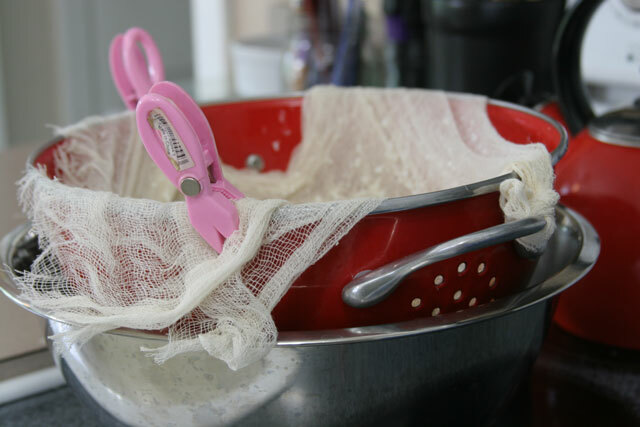 While the milk is coming to temp, line a large colander or strainer over a bowl with double cheesecloth. I jury rigged mine like below. 3. Once the cheese has sat for a few minutes in step 1, gently and slowly pour the mixture into the cheese cloth. Let stand at room temperature for a minimum of 2 hours. I did 3 hours, it was glorious. Serve with toasted baguettes drizzled with honey or balsamic vinegar, on flatbread, or in pasta. I used this as an appetizer and as a filling for homemade raviolis. The possibilities are endless. Lasagna too! 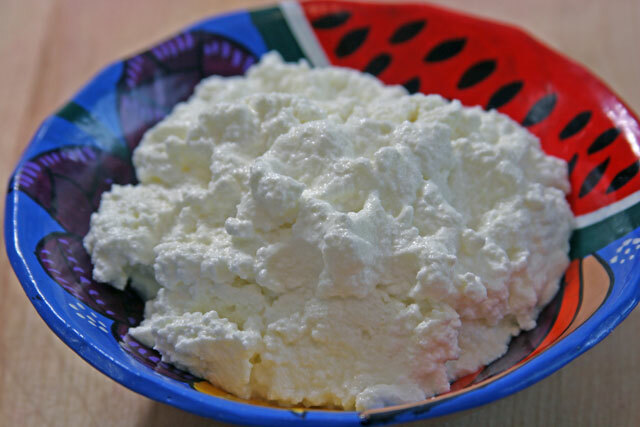 I have a friend who always makes her own fresh ricotta, though I’ve never tried it myself. I’ll have to try it now! It is so creamy good! I am obsessed with this recipe.